Kashgar, China. We’d reached the city I’d wondered about for months – reading and learning about its’ history as a trading post between East and West, Chinese, Pakistani, and Central Asian traders for hundreds of years. I wanted to get out, walk around and see for myself. Murph decided to come along too but our boys opted to stay in the hotel relaxing. The streets felt like a dusty, dirty, busy Chinese city but the cultural melange that makes Kashgar special was tangible from many shaslik grills smoking, the guttural, Turkish-sounding Uighur, the men’s embroidered hats and the many variations of women’s dress. We passed older women elaborately coiffed with scarves over their heads, young women, faces hidden behind full veils and garish Uzbek ikat-patterned silk as dresses, pants and scarves and even young Chinese women in short shirts and high heels – although these were in the minority. Conservatism, from cultural tradition or religious edict, was the guiding principle on this particular catwalk. Heading towards the Old Town, we dodged still-moving cars at a pedestrian crossing. A Muslim woman in a hajib and long, dark clothing with an infant in her arms was coming the opposite way. As we passed I couldn’t help but stare: she was nursing her baby while walking through the intersection and not very discretely either. “Did you see that?” I exclaimed to Murph. “I wouldn’t have thought that nursing in public would be OK here – especially not while walking around”. He grinned with an I-can’t-help-being-so-witty smile. The image of a stern mullah explaining to a new mother that she must cover her head but showing “Foodie Boobies” – i.e. nursing in public – was OK made me laugh out loud. 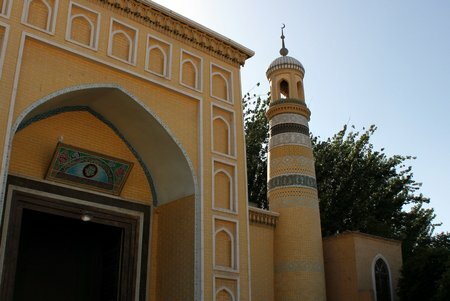 We turned down toward the Id Fah mosque, a commanding building on a broad square, the cultural and physical heart of Kashgar. The entrance, in yellow and white with a single line of lapis lazuli tile above the main door, is at least three stories high and is flanked on either side by similarly-sized towers. The base of the towers are also yellow and white but the varied bands of geometric patterns in white, yellow and black on the upper half of each tower lead your eye naturally to the proud crescent on the top dome. Everything shimmered in the hot afternoon sun. Seeking shade, we headed into the lane of tourist shops to the left of the mosque. Tourist kitsch obviously isn’t very big business in Kashgar. There were two vendors selling prayer-mats who ignored us completely. The four or five sellers of traditional men’s hats – blocky, in green or black velvet with white embroidery and curved seams, the crown a square yet with circular rims – halfheartedly tried to entice Murph to take a look but didn’t seem too bothered when we continued past. The tourist shops gave way to a more traditional bazaar with rounds of fresh baked bread, piles of shoes and bigger piles of dried fruit but still no shade. We took a side street. The first store we passed had an array of knives laid out on display. I could hear the whine and crack of metal against stone. I’m sure if I’d been able to read the Arabic and Chinese sign it would have said “Knives Sold, Repaired and Sharpened Here”. We walked down the street and the whirr of machines became louder even drowning out the constant tooting of scooter horns – Murph had to pull me out of the way of one impatient driver. We stood mesmerized in front of a woodworking shop, ignoring the painted urns, boxes and toys on the street shelves. We only had eyes for the spinning block of wood on a vice just inside the shop. The man working the wood would have been sitting in the shop window if it had had a window. He was wielding a vicious-looking metal spear. With each turn the wood had a new whorl or curve from quick, skilled movements we could barely discern. He carved, we watched, breathing in the barest scent of soft white wood as shavings flew. The machine stopped and it was as if a spell had been broken. I looked around and noticed a small, grubby boy, maybe four or five sitting between us and the carpenter, an orange in one hand. Someone must have started to peel the fruit for him since there was an inch of the flesh visible but he too had been entranced by the magic of the machine. The partially-exposed segment was covered in a thin film of wood dust and he seemed to have forgotten his snack entirely. He looked up at me with deep, dark eyes. I smiled, he blinked. Such long lashes. I’m pretty sure he didn’t know what to make of us. The machine started again, dust flew onto his orange and his gaze returned to the spinning wheel. We moved on. Information on traveling to China with Children. This entry was posted in China, International Escapades and tagged China, China With Kids, Kashgar, Silk Road, Western China on June 13, 2011 by wandermom. I think thats kind of odd as well that she would be walking without really covering up the fact that she was nursing but I guess Foodie Boobies really is okay.